...and of course, chocolate chips from West African, or South American, chocolate. We tried to read the story, which as you might have guessed from the above, is pretty similar to Marjorie Priceman's How to Make an Apple Pie and See the World, only with chocolate chip cookies, as we mixed the ingredients, but got lost in the enjoyment of the moment, somewhere around the salt, and settled for making the cookies first, and then poring over the story, and accompanying map of ingredients once they were baked. For more fun with geography, be sure to check out this week's History and Geography link-up, now hosted by All Things Beautiful. I can see everyone was having fun making and eating cookies. This was sure a fun post to read! We just read Apple Pie book, it's interesting that there is another book like that. Perhaps some baking is in order here as well, we'll see if it fits into our already busy schedule. Natalie - If you're too busy for a batch of chocolate chip cookies - you need to slow down! We love the apple pie and cherry pie books, so we will definitely have to read this one! I agree it sounds like "How to Make an Applie Pie," and we loved that book. I'm trying to remember the author's United States book. Good excuse to make cookies ... not that you need one. 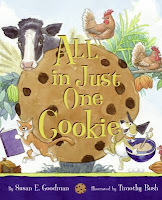 Chocolate chip cookies are my favorite and coupled with a good book would pretty much be heaven! :) I just wrote down this book and can't wait to try out this activity! We loved the apple pie book too! I didn't know about the chocolate chip one until now, but I'll be looking for it. Both of my girls learned addition and subtraction with chocolate chips!